I’m still feeling energised and excited by the fantastic results we won at the South of England show 10 days ago, and I need to spend some time to explain why I’m so happy with the results. But for now – I realise I’m been a bit slack in updating you on how things are going in the fry ponds. In short – very well. It’s the best start to a season that we’ve ever had. As a reminder, we have the May 17 #1 spawning – this was my new 2/3step momotaro female with the dianichi males, and a new sakai male in there too. The spawning went really well, and great fertilisation rates. But the hatch wasn’t as high as I expected and we ended up with a few 10’s of thousand hatchlings. I put around half of them into the top fry pond outside, and we grew the other half on in our tubs in the polytunnel. The fry pond has done ok. Nothing spectacular, but we do have some thousands of koi fry there – nearing harvest size. Over the last few weeks I’ve been monitoring the pond and gauging it’s productiveness by watching the rate at which the fry have been growing, and also gauging numbers. There’s not much science in that to be honest, just applying the experience gained over the last 4 years and being able to understand how things are going relative to previous experienes of things going well, and things going badly. Last week the daphnia population exploded, and there’s more food available that there are fry to eat it. This is a reverse of the position of a few weeks ago –when early on in the pond’s use, I felt the food levels in the pond were too low. And I think that’s why the numbers of fry we are seeing in there now isn’t higher. The numbers aren’t bad. 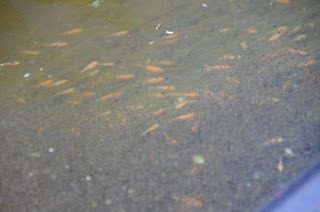 But we’re way off a full pond – which I classify to be c.20k 1st selection sized koi fry. That’s the target each time we use a pond. So, last night I took the few thousand of hatchlings that we’ve been growing on in the polytunnel and put them outside into the top fry pond. This will top up the numbers, and with so much food available – it should increase our harvest without denting the progression of the fry already in the pond. And, all the fry are from the same spawning so it keeps things clear for me on that front too. 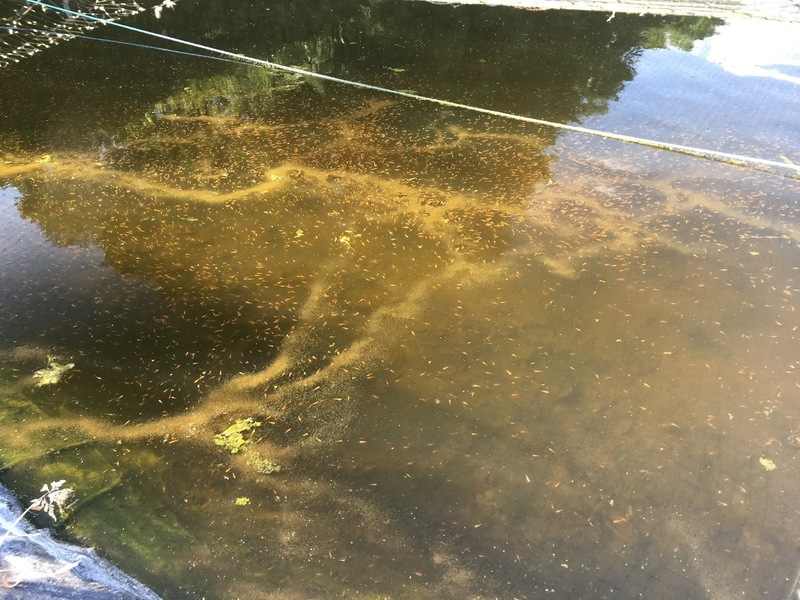 Moving onto the other fry pond – the bottom fry pond….. This pond is doing incredibly well. It’s going roughly as well as when we used that pond last August and pulled out around 35k fry at 1stselection size. We could be on for something similar this time if the pond holds up over the next couple of weeks. We have fry all around the pond margins in large numbers, and you can see them in the centre of the pond too – also, in numbers. 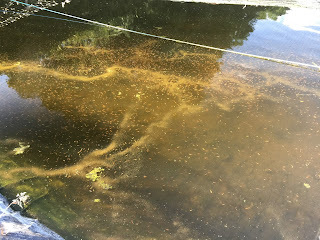 We’ve had a daphnia bloom, and the number of fry are so large that I have a different problem in this pond now – which is to provide enough food for the massive number of fry, without making the pond go bad. I reflect back to the May 15 spawning, which we reared in the top pond. That as also a great harvest, but we ended up having to harvest the pond earlier than I’d have liked because the food had all but run out, and a spongy type algae was starting to run riot. I’ll be keeping a close eye on the bottom pond over the next couple of weeks. We’re in the middle of a really warm period, and I measured the water temperature the other day at 26 degrees C. So, that will also help to grow the fry a little quicker, and at this point – I just want them to reach 1st selection size as quickly as possible so I can bring them inside. In addition to the large volume of fry, there’s another exciting aspect too. 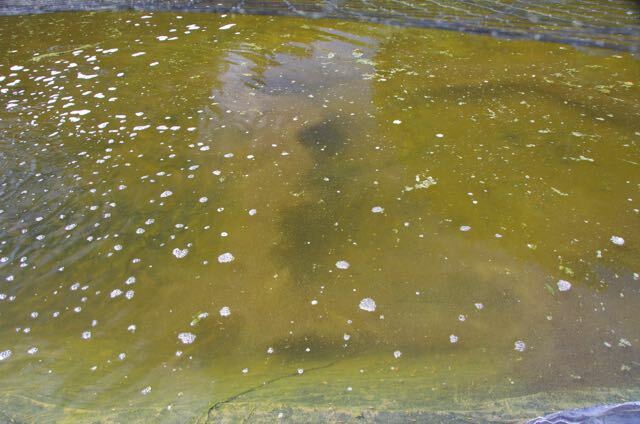 This pond contains the fry from our May 17 #2 spawning and this is the first spawning where we put one of our best females with two males that are each of the best quality that we can afford. The female is from takigawa – the last female I bought, which was bought specifically for breeding from. And, comfortably my best 2 males which are from matsue. So finally, after 4 years, I have a potentially decent sized harvest from a brood set where all 3 individual fish have qualities that are at the top end of what I can afford in brood stock. Now, lets not forget that I’ve been breeding show prize winning kohaku’s from my other brood fish – and I can now say, I’ve been achieving that level that regularly. And I’ve achieved that with good brood set combo’s which aren’t necessarily my best individual fish. It shows good results can be obtained when you find a good match. I am obviously quite excited through about the prospect of growing baby fish that come from parents where all 3 have great skin, body and colour. It can ofcourse, all go wrong from here. Lets not forget, there’s still a lot of husbandry to carry out before these fry are harvested. The very high number of them providing me with considerable challenge to manage them within the confines of our limited facilities. And, the pond is turning the wrong way, as I type this. 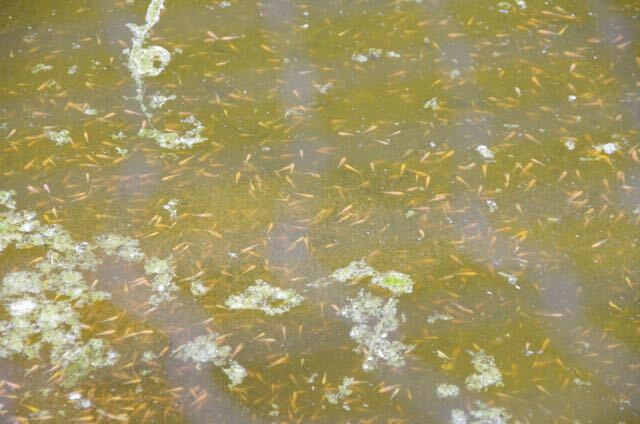 There is a temptation to move some of these fry to the top fry pond – which has an excess of food available above the fry population. It would almost certainly increase the total harvest across both ponds. But, for the moment – I’m not doing that because ideally, I want to have a clear view of the quality that’s come from just the May 17 #1 spawning. 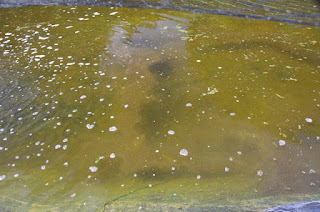 And mixing in some May 17 #2 spawning fry into the top pond would stop me gleaming that useful breeding genetics info. So for now, it is worth sacrificing the opportunity of a greater harvest across both ponds combined – and I’ll keep each spawning separate for the improved intel. 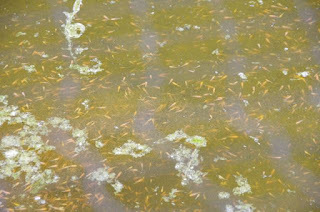 So, overall – we have fry in pond fry ponds, in good numbers. It took me until the end of the 4th year to achieve that situation for the first time – that was the August 16 spawning. And, we’ve managed to achieve something similar again, very quickly. So, it’s promising – both from having a good start to the season, and also in terms of building our confidence that we are starting to find our feet with the breeding side of things. The challenge in the bottom pond is mounting though. And that's going to lead to some nervy days over the next 2 weeks as the fish grow to harvestable size.